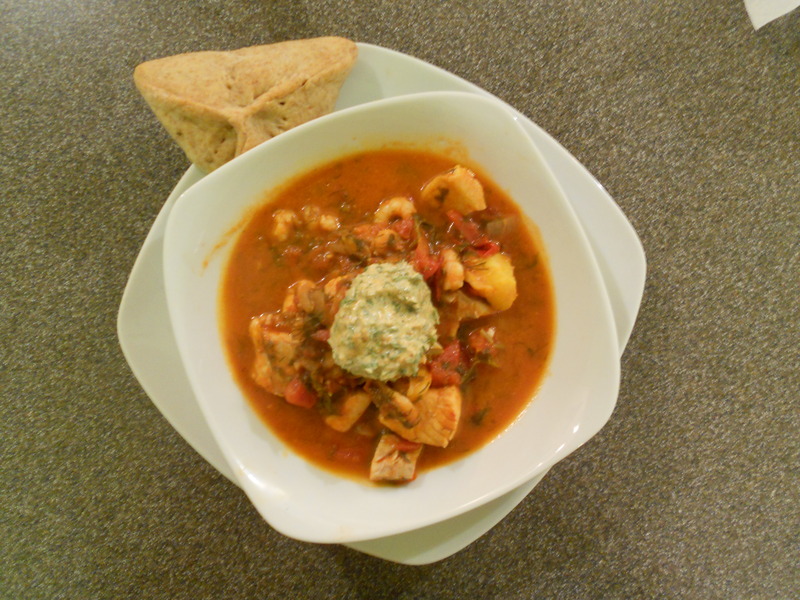 I served the fatayer from my last post with this fish stew and having vaguely referenced bouillabaisse recipes, I made my own version of the spicy “rouille” it is normally served with. Ever the over ambitious I even decided to make my own harissa which is an ingredient in the “rouille”. This comes with a serious health warning, I saw a recipe that told you to cut up dried whole chillies which I WOULD NOT RECOMMEND. Just buy chopped dried chillies unless you want to end up breathing in chilli dust and nearly choking to death as your lungs burn. Even wrapping my scarf over my face like a kitchen ninja didn’t help. The fish stew became a bit of an exercise in how many herbs I could throw in a pot, to which the answer was: lots. If you wanted to simplify it I’d say the parsley is the priority, followed by the bay leaf, then the thyme and the fennel last. You could use any white fish instead of the tilapia like cod or pollock, and any smoked fillet instead of the smoked haddock. Skin the fish fillets, and chop into bite size chunks. Select a heavy based pan and fry the anchovies, garlic , onion and the chopped stalks of parsley until the onion and parsley are softened. Then throw everything apart from the fish in, and make sure you cut the satsuma in half, squeeze the juice in and then add the two halves to flavour the stew more. Rinse out the tomato tins with water and add the water to the pot. Simmer for 15-20 minutes, remove the satsuma halves and then add the fish. Simmer for a further 15 minutes until the fish is cooked through and season to taste. 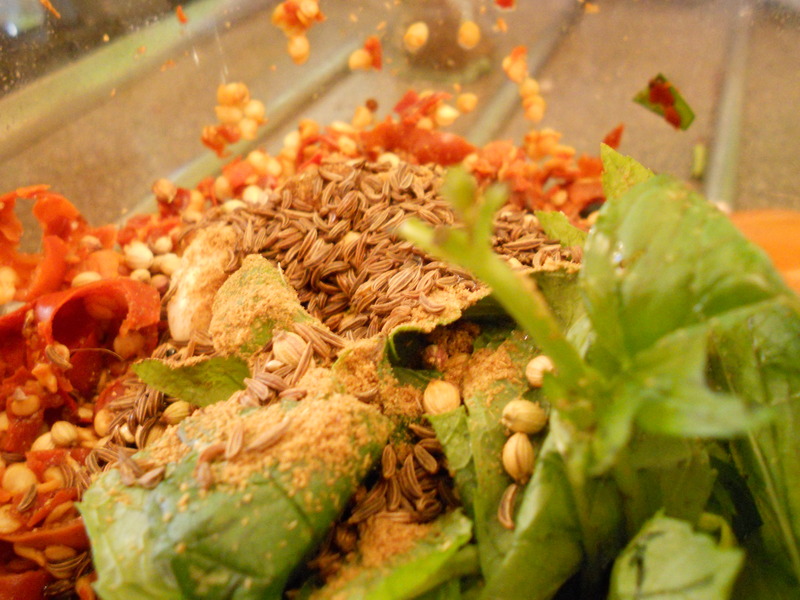 To make the rouille just stir all the ingredients together. Serve the stew in hot in bowls, with a dollop of rouille on top and fatayer or hot bread. Soak the dried chillies in boiling water for an hour and then drain. After that I was really lazy and didn’t chop anything just chucked it all in a blender and blitzed it until it becomes a rough paste. Store it in a sterilised jar in the fridge with a layer of olive oil on top to seal it. It should keep for 6 months. To sterilise a jar preheat the oven to 120C, wash the jar soap and water, then rinse with very hot water, place in the oven until completely dry (roughly 20 minutes). Alternatively take hot from a dishwasher, in both cases just make sure you don’t dry it with a tea towel.